Sean Maguire clashes with Gibraltar 'keeper Kyle Goldwin. 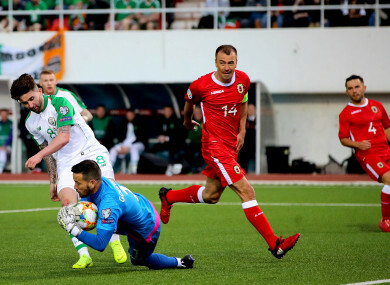 SEAN MAGUIRE’S FIRST competitive start for Ireland came tinged with frustration, as the striker admitted he wasn’t fully happy with his own performance in a nervy, windswept 1-0 Euro qualifier win against Gibraltar. “Obviously it’s great to start for my country”, Maguire said after the game. “A first competitive start, it’s an honour for me and for my family, but I thought I would have been in the game more. I could have seen myself getting my first goal, but it wasn’t meant to be. Maguire showed some neat touches in the first-half – one clever reverse pass for Seamus Coleman in the penalty area stands out – but struggled to make an impact after the break and was replaced by Harry Arter, with Mick McCarthy keen to redress the numerical imbalance in midfield. With Gibraltar happy to defend deep for long stretches of the game, forcing Maguire to rely on an element of his game he admits needs work. It’s something I need to add to my game because at club level, teams are coming to Preston and sitting back, and they’re the games that I don’t really score in and do well in, so that’s something I really need to work on, dropping deep and sucking defenders in and then spinning in behind. Mick McCarthy said afterward that it was a “horrible” game from which he was just glad to emerge with a win, and Maguire echoed his manager’s thoughts. “They were tough conditions out there considering the artificial pitch, windy conditions, very open ground, but there are no excuses. “Probably a bit of nerves [accounts for poor performance.] Obviously, everybody has a clean slate with the new manager and everyone wants to impress. We made it tough at times for ourselves. “They made it difficult with two banks of four and I suppose my game is in behind, stretching defences and I couldn’t do that, particularly in the first half, only a couple of times. “In the first 10 or 15 minutes of the second half, I thought I did a bit better in terms of stretching the defence, getting in behind and creating chances. “Ultimately Didsy [McGoldrick] got in behind and slipped Jeff through and it was an important goal at an important stage. While he admitted to struggling somewhat, pride was the better part of Maguire’s emotions post-game. People within Ireland want me to do well because I’ve come from the League of Ireland and then pushed on at Preston. Look, it’s great to put on the green jersey and play for your country out here on the biggest stage in front of the best fans in the world. “We didn’t particularly play well or anywhere near our best and they were singing from the first to the last, and that’s something that can make a real difference in a frustrating game like today. As Maguire made his first competitive start for Ireland, his captain Seamus Coleman ticked to a half-century of appearances for his country. “Probably my first thought is I would have liked them to have come a bit quicker”, said Coleman reflecting on the milestone. “I’ve been around the block for quite a while on the international scene and I didn’t play much under my first manager, who was a brilliant influence for me, Trapattoni. The last time Georgia were in Dublin they were beaten 1-0, thanks to Coleman’s only goal for his country. Not that it was a wonder goal, by any stretch of the imagination. “Wonder-goal? I scuffed it over the line. I’ll take any goal I can get at this level. Georgia visit the Aviva on Tuesday, with Ireland hunting for a first competitive win at home since beating Moldova in October 2017. Email “'I thought I would have been in the game more' - Maguire admits frustrations with debut competitive start”. Feedback on “'I thought I would have been in the game more' - Maguire admits frustrations with debut competitive start”.